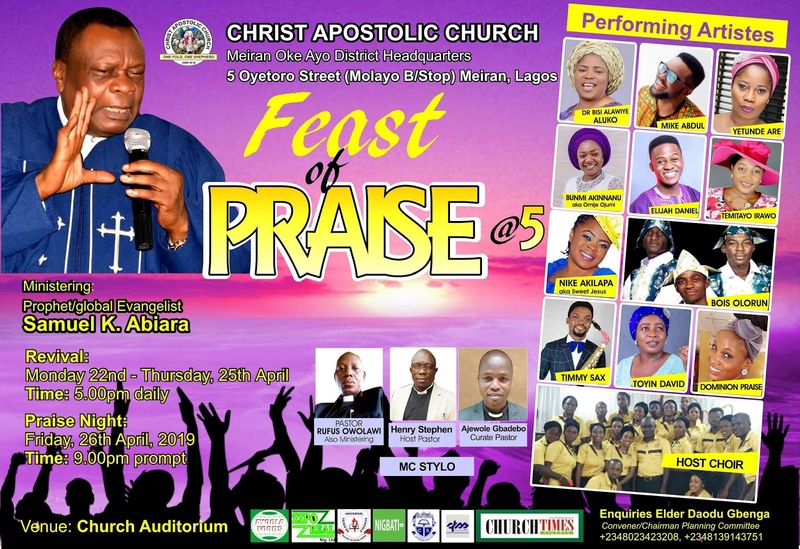 Christ Apostolic Church, Meiran, Oke Ayo District Headquarters, Meiran, Lagos says the fifth edition of its Feast of Praise annual programme would hold between Monday, April 22 and Friday, April 26. The convener and chairman, planning committee, Elder Gbenga Daodu, explained that there would be revival between Monday, April 22nd and Thursday, April 25th at 5pm on each day, while the praise night would hold on Friday, April 26th, 2019 at 9pm. 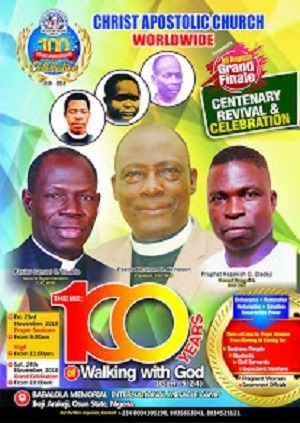 He added that the programme, which would at the church auditorium, would also feature the former General Evangelist of the Christ Apostolic Church, Prophet Samuel Abiara, as the minister, while other ministers expected to preach at the event are Pastor Rufus Owolawi; the host pastor, Henry Stephen, and the Curate Pastor, Ajewole Gbadebo. Daodu pointed out that the programme is interdenominational and that it would be an unforgettable night of praise and worship. 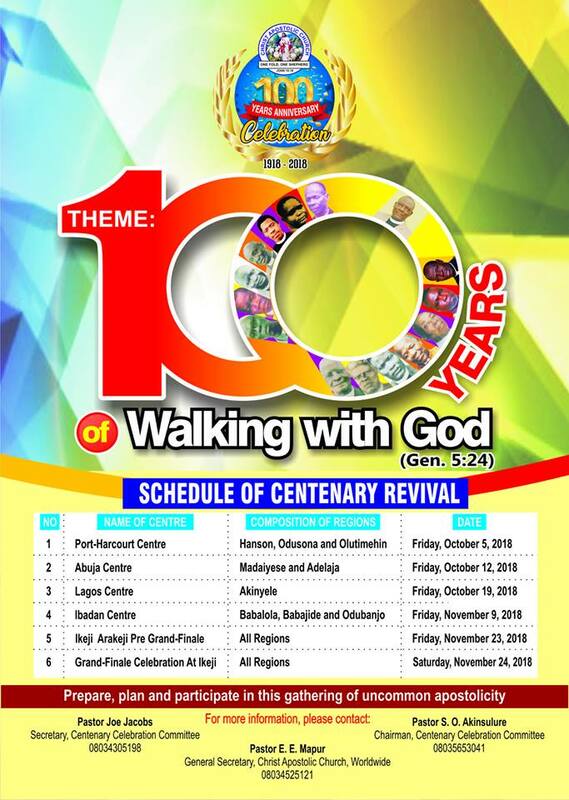 The reputable gospel artistes and popular comedian expected thrill the congregation include Evang Dr Bisi Alawiye-Aluko; Mike Abdul; Yetunde Are; Bunmi Akinnanu, aka Omije oju mi; Elijah Daniel, aka Omo Majemu; Temitayo Irawo; Pastor Sope Rufus; Evangelist Nike Akilapa aka Sweet Jesus; Bois Olorun music group, Wale Sax, Timmy Sax, Toyin David, Dominion Praise and the host choir. 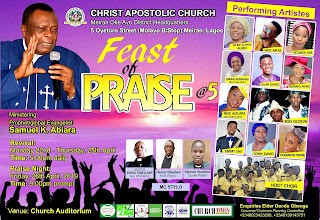 Daodu said, “The purpose of the Feast of Praise 2019 is to propagate God’s ministry, and the programme is a product of God’s inspiration and it is free for all denominations. Salvation is free, and so we enjoin everyone to attend because it will be a blessing to all. “There will be miracle, release of blessings and healings through worthy praise to God. The programme is billed to start by 10pm till dawn at the church auditorium, Christ Apostolic Church, Meiran Oke-Ayo District Headquarters, located at 5, Oyetoro Street, Molayo Bus Stop, Akintan-Meiran, Agbado Oke Odo Local Council Development Areas, Lagos."